Lonati Anglo-American School (LAAS) is a private educational institution serving the needs of Italian and foreign students within the region of Lombardy and the province of Brescia in northern Italy. 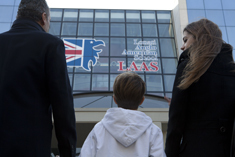 LAAS is an International Baccalaureate World School offering the Primary Years Programme (Kindergarten to Grade 6). Our Early Years and Elementary School is also legally acknowledged by the Ufficio Scolastico Regionale per la Lombardia and approved as scuola "NON PARITARIA" legally recognized by MIUR (Ministero dell’Istruzione, dell’Università della Ricerca). The school provides an international education in English for students from three to eleven years of age with standards and values of the highest quality. The school offers an independent course of studies that prepares students with the knowledge and skills to meet the future. Classes are specially designed to guide and instruct students for successful completion of Primo Esame di Stato (EX Esame terza media – the Italian state exam for Italian students). In addition, students participate in the LAAS Personal Investigation Project (PIP) and sit for both the Cambridge Preliminary (PET) and Instituto Cervantes Spanish-language examinations.